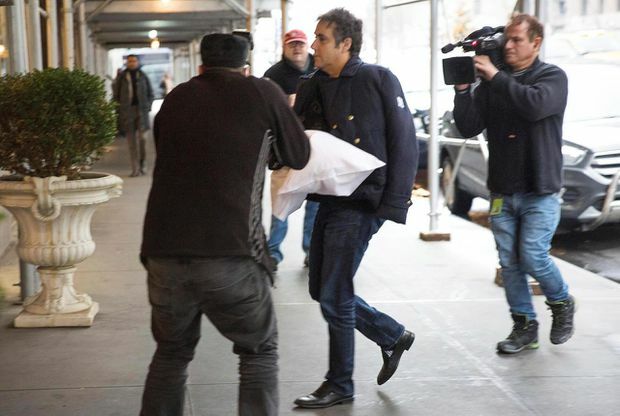 Michael Cohen arrives at his home in New York with his left arm in a sling supported by a pillow Friday, Jan. 18, 2019. Impeachment proceedings against U.S. President Donald Trump are becoming increasingly likely amid reports Special Counsel Robert Mueller has uncovered evidence of collusion between the President’s campaign team and Russia – as well as efforts to thwart investigations into it. Earlier this month, court filings revealed Mr. Mueller had discovered that Paul Manafort, Mr. Trump’s former campaign chair, shared campaign polling data with a man tied to Moscow’s spy agencies. Then, late on Thursday, Buzzfeed News reported Mr. Mueller had turned up documents that show Mr. Trump ordered his former lawyer, Michael Cohen, to lie to the U.S. Congress about a prospective deal to build a Moscow hotel. The developments appear to advance both prongs of Mr. Mueller’s probe: Alleged co-operation between the President’s campaign and the Kremlin to tip the 2016 election and potential obstruction of justice to cover it up. They prompted the new Democratic majority in the U.S. House of Representatives to double down on promises to investigate Mr. Trump – and try to throw him out of office if the information turns out to be correct. “If the Buzzfeed story is true, President Trump must resign or be impeached,” Texas Representative Joaquin Castro tweeted. Adam Schiff, chairman of the House intelligence committee, said his panel would pursue the matter. “These allegations may prove unfounded, but, if true, they would constitute both the subornation of perjury as well as obstruction of justice,” he said in a statement. Mr. Trump fired back on Twitter, accusing Mr. Cohen of “lying” to Mr. Mueller in a bid to get leniency in his own criminal case. The President also appeared to threaten the father of Mr. Cohen’s wife, who has been accused of financial wrongdoing in the taxi industry. “Watch father-in-law!” Mr. Trump tweeted. Mr. Mueller’s spokesman took the unusual step of saying at least some of BuzzFeed’s story was wrong. “BuzzFeed’s description of specific statements to the Special Counsel’s Office, and characterization of documents and testimony obtained by this office, regarding Michael Cohen’s Congressional testimony are not accurate,” Peter Carr, Mr. Mueller’s spokesman, wrote in an email late Friday. Mr. Carr did not say what, specifically, was inaccurate in BuzzFeed’s story. Jonathan Turley, a Washington-based civil-liberties lawyer and constitutional law expert, said the accusations against the President – if true – put him in both legal and political jeopardy. The question will be what evidence Mr. Mueller has amassed beyond the admission of Mr. Cohen, who has repeatedly lied in the past to both investigators and legislators. “Encouraging someone to lie to Congress … would be a clear crime. It would also be a legitimate basis for impeachment if he did that while he was President,” said Prof. Turley, who teaches at George Washington University. While Mr. Mueller has kept a tight lid on his findings so far, this month’s developments offered a substantial look behind the curtain. Last week, a court document revealed that during the campaign, Mr. Manafort gave polling information to Konstantin Kilimnik, a Russian business associate allegedly connected to the Kremlin, and discussed a “Ukrainian peace plan” with him. Mr. Mueller accused Mr. Manafort of hiding information about these discussions from investigators. Mr. Manafort maintained he simply forgot to disclose them. Even Mr. Trump’s team, which had once insisted there was “no communication between the campaign and any foreign entity,” now conceded that it was at least possible that someone colluded – just not Mr. Trump. “I never said there was no collusion between the campaign or between people in the campaign,” Trump lawyer Rudy Giuliani told CNN on Wednesday night. Mark Simakovsky, a former U.S. Defence Department official who worked on the Ukraine file, said there is mounting evidence Mr. Manafort had some “specific objective” in his dealings with Mr. Kilimnik beyond simply doing business with him. And he said it will be hard for Mr. Trump’s circle to make Mr. Manafort the “fall guy,” given that the abortive Moscow hotel deal appears to tie several other people to Russia and offers a possible motive for the Trump campaign’s decision to adopt a more conciliatory stance toward President Vladimir Putin’s regime. “They could try to cauterize the wound so it doesn’t extend to the President. The problem is that the wounds extend beyond one individual,” he said. Mr. Cohen was sentenced last month to three years in prison for, among other things, falsely telling Congress the unsuccessful Moscow project had ended before the first presidential primaries in early 2016. In fact, he later admitted, he continued to work on the deal until after Mr. Trump had secured the Republican nomination. According to Buzzfeed, Mr. Mueller uncovered internal Trump Organization e-mails and text messages that indicate it was Mr. Trump who told Mr. Cohen to lie about this. Mr. Cohen, the outlet reported, subsequently confirmed this to Mr. Mueller. The President and his family were also more directly involved in the project than they have let on, Buzzfeed said: Mr. Trump was kept apprised of Mr. Cohen’s conversations with Russian officials and encouraged him to arrange a trip to Russia and a meeting with Mr. Putin during the campaign. The trip did not happen. Jennifer Lawless, a political scientist at the University of Virginia, said that if the reports are true, the case for obstruction of justice is stronger than for collusion. For instance, the articles of impeachment against Richard Nixon and Bill Clinton both involved obstruction. It hasn't helped the administration's case that four of Mr. Trump's associates have pleaded guilty to making false statements to Mr. Mueller's investigators. “There are so many people who have lied about things they didn’t have to lie about,” Prof. Lawless said.